There’s a brand new interview with Uncanny Magazine editors Lynne M. Thomas & Michael Damian Thomas on the Hugo Award-nominated Skiffy and Fanty Show. 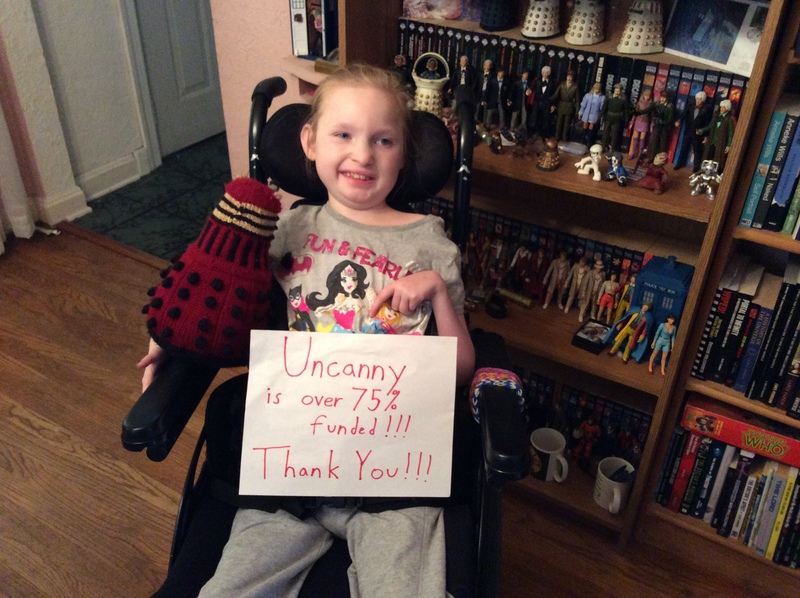 In other news, Uncanny Magazine is now 75% funded!!! We are so excited to be this far after one week. The sooner we hit 100%, the sooner we can open up to unsolicited submissions. Since we hit 75% yesterday, one of yesterday’s new backers will receive a signed copy of The Book of Apex: Vol. 4. This anthology collects all of the original fiction from Lynne M. Thomas’s first 14 issues of Apex Magazine. 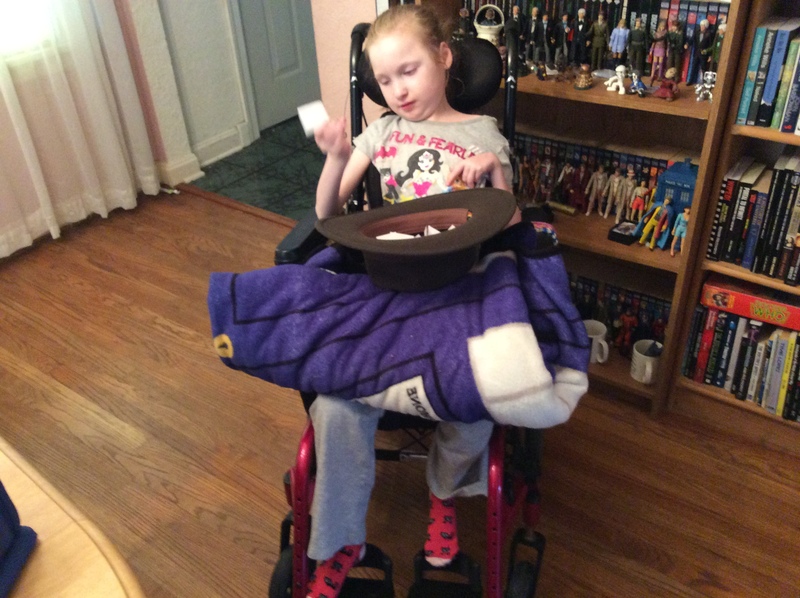 Here is Caitlin drawing the name from her Indiana Jones fedora that she received at the Indiana Jones Epic Stunt Spectacular during her Make-A-Wish trip. The book goes to Michael Silverstein! Congratulations! Click here to support our Kickstarter! We are geeks who have spent the past several years creating and sharing work that gets us excited. Whether it’s sharing true, personal stories of how the community that loves Doctor Who changes lives in Chicks Dig Time Lords and Queers Dig Time Lords or examining humanity at its worst through the horrific stories in Apex Magazine, or throwing a massive, Kickstarter-funded science fictional party through Glitter & Mayhem‘s stories of the dark side of night life and roller derby (because what is more awesome than aliens and roller derby? ), we’ve done our best to bring you stories and images that stay with you, because they feel like they were made just for you. We think that the best science fiction and fantasy literature combines astonishing ideas, strong characterization, excellent, gorgeous writing, and distinctive, diverse points of view from around the world. We particularly love the stories that we can’t stop thinking about, and talking about, because of how they made us feel. We sought out these kinds of stories constantly–they feel as rare as unicorns, and getting to share them with our readers is awesome like a space unicorn (hence our new mascot). We want to take our experiences producing bestselling, award-winning nonfiction anthologies, and two years of a highly popular, award-nominated magazine, and combine them to create a new online magazine, that reflects what we’ve learned, and takes it even further. We’re calling it Uncanny, because we want to produce a sensational magazine that feels like you’ve been here before, in the best way possible. 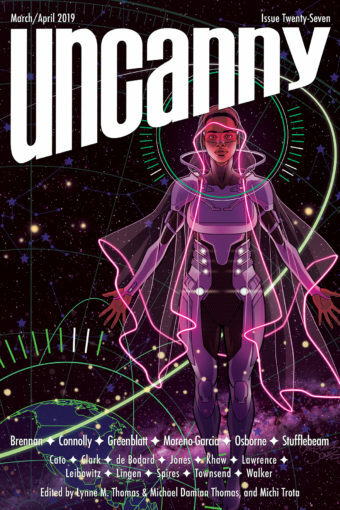 Uncanny will have stories, prose, poetry and cover art that make you feel, and stays with you after you’ve read the issue. 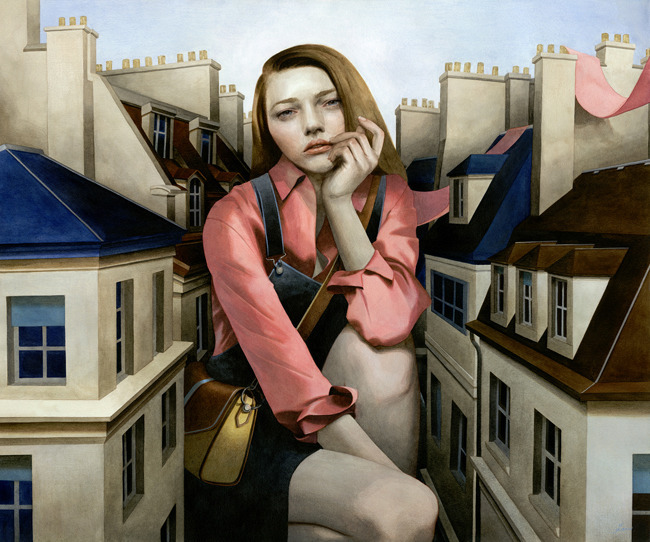 A Sentimental Swallow by Tran Nguyen. (This is available as postcards and prints for some Kickstarter backers). L-R: (row 1) Amal El-Mohtar, Sofia Samatar (photo credit: Adauto Araujo), Charlie Jane Anders, Liz Argall, Rachel Swirsky; (row 2) Maria Dahvana Headley, Mary Robinette Kowal, Neil Gaiman (photo credit: Kimberly Butler), Scott Lynch; (row 3) Catherynne M. Valente, Paul Cornell, Ken Liu, Kat Howard, Hao Jingfang, E. Lily Yu. 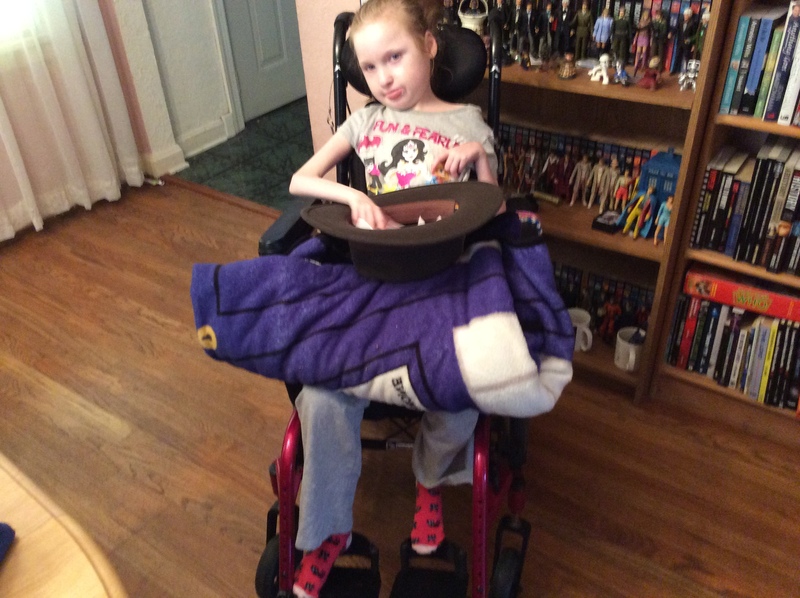 and Catherynne M. Valente (Deathless). Uncanny will also feature cover art by Carrie Ann Baade, Julie Dillon, Galen Dara,Tran Nguyen, and Matthew Dow Smith. 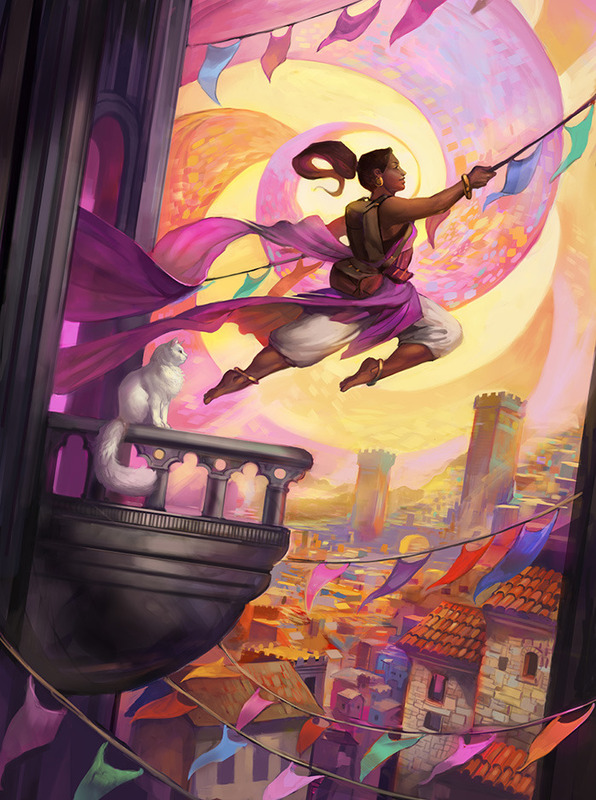 Fortune’s Favored, by Julie Dillon. (This is available as postcards and prints for some Kickstarter backers). There will also be slots for unsolicited submissions. We are deeply committed to finding and showcasing new voices in our genre from around the world. Those reading online for free will have to wait a week for the first half of the issue, and a month for the second half, to appear on the second Tuesday of each month (of November and December, respectively in our example). How are we funding Uncanny? We are fundraising through Kickstarter to cover the start up costs for launching a professional online magazine. We intend to pay our writers $ .08 per word for original fiction, our poets $30 per poem, and our essayists $50 per essay, and our artists $60 per reprinted artwork. In addition to paying our contributors, our budget includes hiring Clockpunk Studios to set up, design and host a robust website; podcast production and hosting costs; and covering backer rewards and Kickstarter fees. 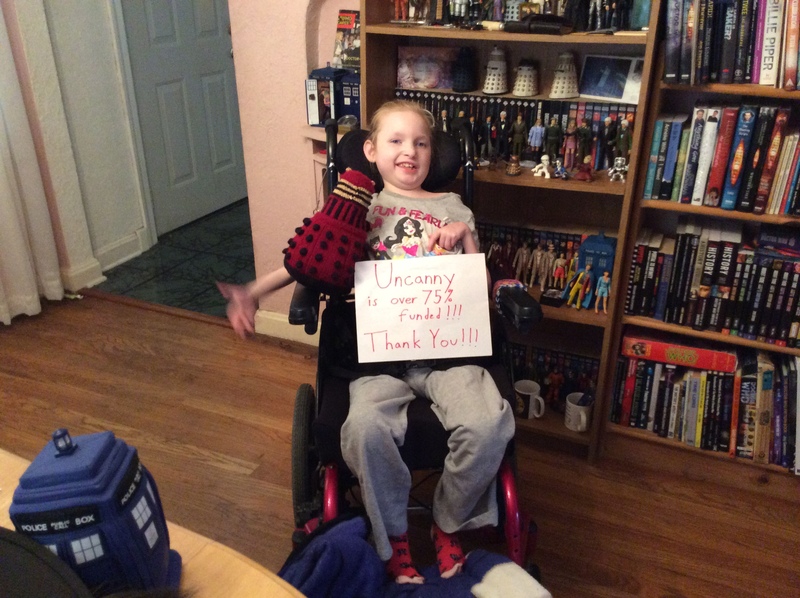 Help us bring the Uncanny to life by backing our Kickstarter! Fundraising will run July 29 – August 28, 2014.